It's not Christmas, but Supes and Superita are under attack by the Red and Green Menace! And pink. Good gravy, Brainiac, you may be the smartest being in the galaxy, but who sold you that suit? 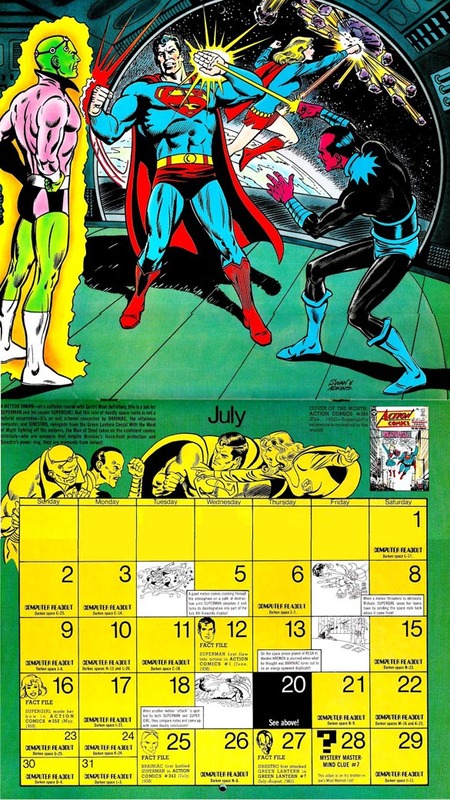 Anyway, Kal 'n' Kara are battling not only one of their most dangerous nemeses but also one that belongs to Green Lantern, because hey, Hal Jordan couldn't pick up the slack? Sheesh, Hal. 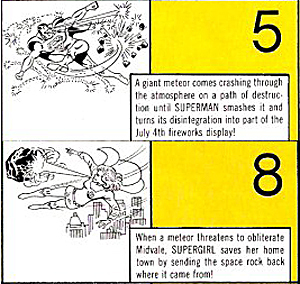 The super cousins must also deal with Brainiac and Sinestro dropping meteors on Earth, obviously cosplaying the popular 1998 disaster motion picture Armageddon, starring Ben Affleck as Vril Dox and Liv Tyler as Thaal Sinestro! Ughhh, now I never want animal crackers ever again. But don't forget to buy the Armageddon Criterion Collection DVD, because...geez, I don't even know why. Just accept it all happened. 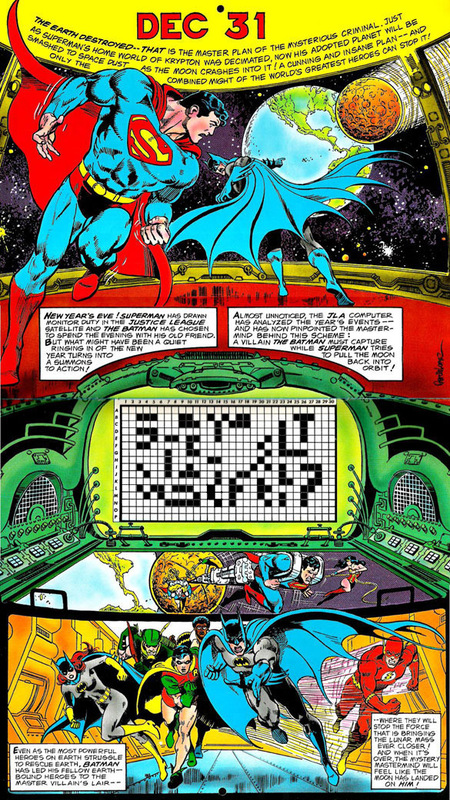 As always I've continued to fill in the blank checks as instructed to allow the JLA computer, working hard with its 5K of RAM, to compute the identity of the top supervillain behind all of 1978 2017's super-disasters. Honestly at this point, your guess is as good as mine whether it's going to draw a picture or spell out words. I think that if you kind of squint at it, it looks like Brainiac giving us the finger. Okay, let me step slightly outside the conceit of this post and admit: even tho' I've got a pretty good idea who the super-villain is, I absolutely didn't know what or who this clue referred to. I descended into the Great Bully Comic Book Vault (it's cool down there in the summer!) 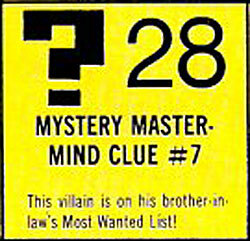 and pulled out some back issues to research, and I can now tell you the story behind this cryptic clue. However: I can't discuss it without revealing who's the nogooidnik behind these Super-Spectacular Disasters, and I don't wanna ruin the surprise for those of you playing along at home. So I'm putting the discussion of this seldom-seen (really!) brother-in-law in a completely different post where you won't come across it unless you voluntarily click this link. 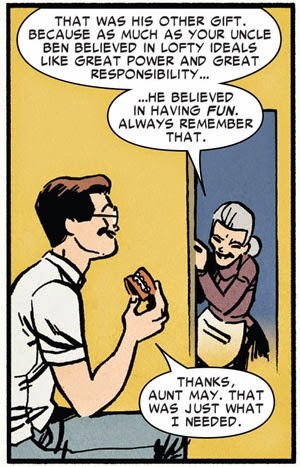 Who says it isn't the Bountiful Bully Age of Spoiler Warnings? The poor warden of space-prison planet Rega-IV... it's a Hrdnox life for him. 365 Days of Defiance, Day 182: ESU  Phew! Please look after this author. 365 Days of Defiance, Day 179: Cheese It!